Green Lanterns #25 Review – AiPT! Green Lanterns has been one of the most consistently entertaining series to come out of DC Rebirth and a lot of that has to do with Sam Humphries’ great character writing. Regardless of threat or world building he always manages to keep the reader in the head of the characters. He’s also been doing a great job slowly building up to Volthoom’s rise, which appears to be taking a big step forward this week. “LOST IN SPACE’ part four! In this extra-sized anniversary issue, Simon and Jessica adjust to a new status quo, while Volthoom’s schemes advance as he impersonates a lost Guardian. With access to the Central Power Battery and the secrets of the universe at his fingertips, will the First Lantern finally achieve his ultimate goal? New reader friendly, but also paying off what Humphries has been building towards for months, this is the beginning of Volthoom’s plan coming together; it not only involves bringing his old body back, but Jessica Cruz’s ring has a big part to play too. Can’t the ring send a voicemail? Green Lanterns #25 costs an additional dollar, but contains more pages and this issue bounces between billions of years ago and now quite well. 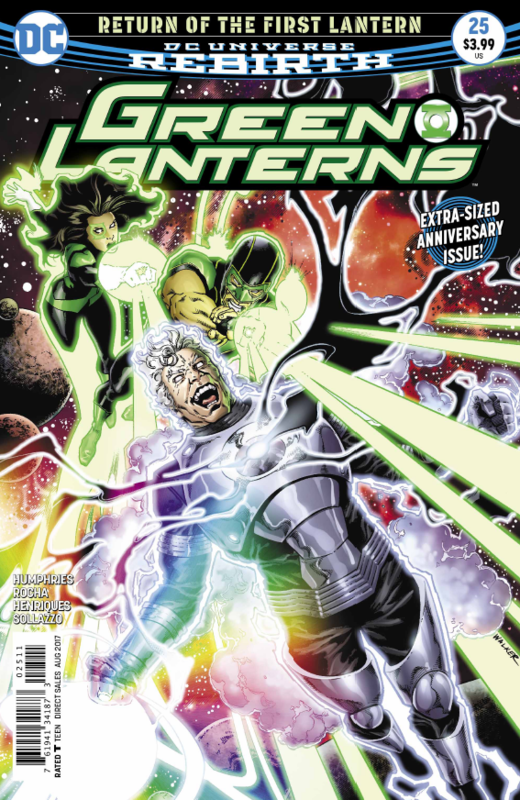 The use of flashbacks breaks up the main story so as to increase tension and fill the reader in on some new history when it comes to the Green Lanterns. It all starts with Simon, Jessica, and a banished Guardian (who is now possessed by Volthoom) entering the Vault of Shadows. It’s a very old temple of sorts that Green Lanterns aren’t supposed to be entering. Humphries uses this mysterious location to unveil additional ancient artifacts and also turn the tide in Volthoom’s favor. Readers get to learn about a guardian of this temple named Tyran’R who is now very old, but worthy of a Green Lantern ring. There’s also a reveal of another of the first Green Lanterns in a flashback that fleshes the character out well. It’s clear Humphries is building towards the first Green Lanterns playing a big part in future issues with time and attention given to their character building. This isn’t creepy at all. Speaking of which, Simon gets focused on this issue, with the comic opening and closing with Simon’s letter to his brother. He doesn’t want to let his brother down anymore, but due to his work as a Green Lantern he can’t help but miss birthdays or give him the attention he deserves. This adds an emotional layer to the cliffhanger which makes it clear it’s not Simon’s fault, but it comes with the job. Jessica and Volthoom’s interest in her ring also plays an interesting part and it’s clear Humphries is interested in fleshing out how the power of these rings work. That includes a big moment for Simon and his ring, which should have fans talking. The art by Robson Rocha is excellent, particularly with faces. This artist was born to draw comics with lots of dialogue, as he infuses so much acting in the seemingly most minor panels. The visuals add a connective tissue to the emotions in the book. He’s also incredibly good at backgrounds with an attention to detail that keeps the world looking real. In a flashback to one of the first Green Lanterns for instance, Rocha draws a technologically advanced culture with details in desks, stairs, and the like which makes the quickest of panels feel that much more real. I think he might not be all there. Though more detail on these mysterious first Green Lanterns is great, the flashback to one in particular in this issue feels forced. It doesn’t connect with the current events well–at least not obviously–like the Tyran’R character does earlier in the issue. Cleary she’ll play a part later, but it doesn’t flow quite so well and ends up feeling like an extra story inserted into the middle of the issue. A hell of a lot happens in this issue with some key flashbacks to continue the fleshing out of the first Green Lanterns. Fans of this series will love it because it pays off the slow burn storytelling Humphries has been laying down for months.